Life has a way of regenerating itself. Just when you think that one of your plants is dying, you can take a small cutting of one of its leaves and place it into some new soil. It will almost instantaneously take root and voila – new growth and life appears yet again. Why does this happen? Again, life has a way of regenerating itself. Whatever dies to the old, will certainly renew again. There are many parts of our lives that have outlived their usefulness and in time we let them go so new opportunities and experiences can replace them. Life happens in the letting go phase. You have to die to the old and be OK with that. Don’t try and preserve the years, they need to evolve and dutifully finish. 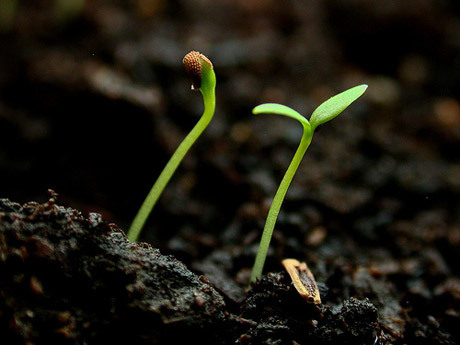 With each letting go (death) of a job, a relationship, or a home, a part of YOU gets re-potted and will begin to grow again in a different and fresher configuration. Life never regenerates itself exactly the same way. New buds signal new change and a new zest for life. Look at yourself as a beautiful plant, when the time has come to let go and let yourself die to the old – take a part of yourself and re-pot it… allow new growth to rejuvenate you and give rise to a new beautiful flower.